While retailers have been moving the start of the Christmas season progressively earlier each year, a few days before Thanksgiving Jeffrey Morgenthaler offered to help shoulder the burden by posting perhaps the first eggnog recipe of the season. Let the Yuletide drinking begin! I still have plenty of supplies laid in from the autumnal drinks I’ve been socking away as of late, but here it is, the day after Thanksgiving, and I’m ready to help Jeffrey soldier on toward the holidays. How to ease the transition? How about a General Harrison’s Eggnog, a drink first written up by Jerry Thomas but helpfully reprinted (and elaborated upon) in — you guessed it! — IMBIBE!, by David Wondrich. The General Harrison in the name, of course, was the old saddlesore commonly known to Whigs of the era and junior-high history students ever since as “Old Tippecanoe,” a reference to an 1811 Indian battle in which Harrison’s troops prevailed. While running for President in 1840, however, Harrison became known — in a positive way — for his drinking habits, which ran to hard cider. Depicted by his supporters as a simple man of the people, who lived in a log cabin and drank cider, Harrison went on to pummel the more patrician incumbent Martin Van Buren. Thomas wrote that this eggnog was Harrison’s favorite drink; considering that the old general dropped dead after just a month in office, the drink’s medicinal properties are probably mild. I’d read the recipe for General Harrison’s Eggnog before, of course, but never had the slightest inclination to mix one. Consider: hard cider (artisan dry, for authenticity’s sake) and a whole egg, with only a little sugar thrown in to make the two get along. Now I’ve got nothing against a raw egg in my drink, but I’m accustomed to having the egg’s viscosity and richness broken up with a good jolt of something substantial — preferably a powerfully flavored aged spirit like whiskey or dark rum. Apple cider? It just didn’t seem to have the requisite gumption to get the drink going. And this is yet another instance in which my foolishness has been revealed. Resigned to giving the drink its day in court, I mixed one up recently and — whaddaya know — it isn’t too bad. Not only not bad — it’s actually pretty damn good. The drink has a much lighter, crisper flavor than any other eggnog I’ve had, and without the contributions from the dairy aisle, it’s also much lighter in body. Thomas’ recipe is somewhat incomplete — “fill tumbler with cider” leaves a lot of room for interpretation — but I tried it out with four ounces of cider to one egg and 3 tsp of 1:1 simple syrup. I took my trusty Aerolatte to the egg before mixing, which helped liven up the consistency, and shook the drink hard in a cobbler shaker, which seemed less likely to blow apart than a Boston shaker when agitating an ingredient with a light carbonation. But don’t just take my word for it — give it a shot yourself, in the waning days of autumn as we head into the holidays. 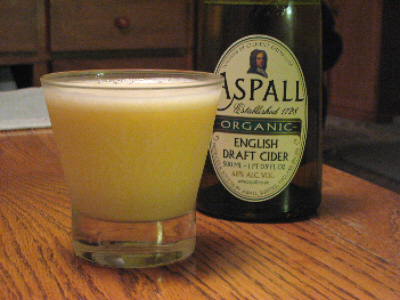 Fill tumbler with cider [about four ounces] and shake well. “This is a splendid drink, and is very popular on the Mississippi river,” Thomas writes. This is a great recipe. It’s even better if you sub in an equal amount of pimento dram for the syrup. I too was skeptical, but tried it anyway and really liked it. I ended up with a slightly sweet cider (Spire) and cut the sugar a bit. I’d like to try it with a nice dry cider too. Since I work out of the house I haven’t had the time to pick up some hard cider. And to be honest, if I did I’d probably forget. But I do have regular cider from a few Chas Adams cocktails and gave it a go with no sugar added. It thought it had great texture and tasted damn good but the bride loves it! This drink sounds good I think I will have to try it out when eggnog is more widely available probably more towards the holidays. I just remembered this cocktail during a discussion.